March | 2017 | Azazel's Bitz Box. Can you say 2nd Edition with me? Can you say 1990’s? Can you say mining old posts for recycled content? *cough* Well, actually I’ve still got plenty of new stuff ready to show after I pull the photos from the camera, and go through the resize-and-crop process, but I was looking at the Detolf I have in the room where I do my painting and spotted this guy – and realised that the last (and only) time I showed this figure was 7 years ago, when I made a total of 9 posts and had fewer viewers for the year than I have in 2 weeks today. So… not many people will have seen this one, comparatively. 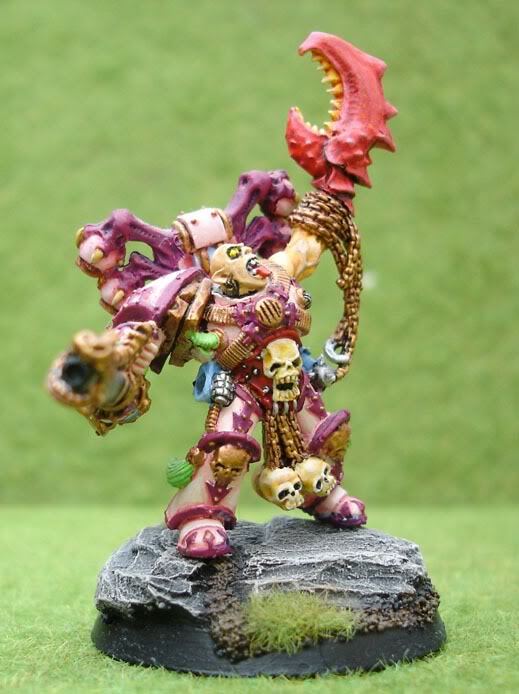 This fine fellow is (was) a Slaaneshi/Emperor’s Children Champion. Converted many years ago for me by Dave M. The base is a Kharn the Betrayer body, with a 2nd-gen Daemonette claw (the only thing that range of Daemonettes were good for, in my opinion), a head from same and a RT-era Chaos Terminator weapon arm – the original Chaos Autocannon – which looked similar enough to one of the 2nd-Gen Sonic Blasters once the chaos skull shoulder pad was glued onto the base of it – from back when such things could be taken by Slaaneshi Champions. 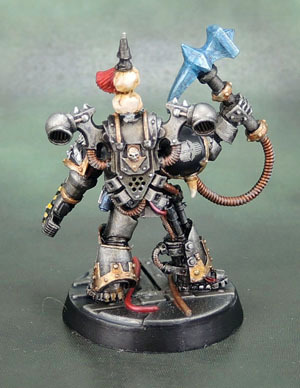 Backpack is from the metal Ahriman of the day. 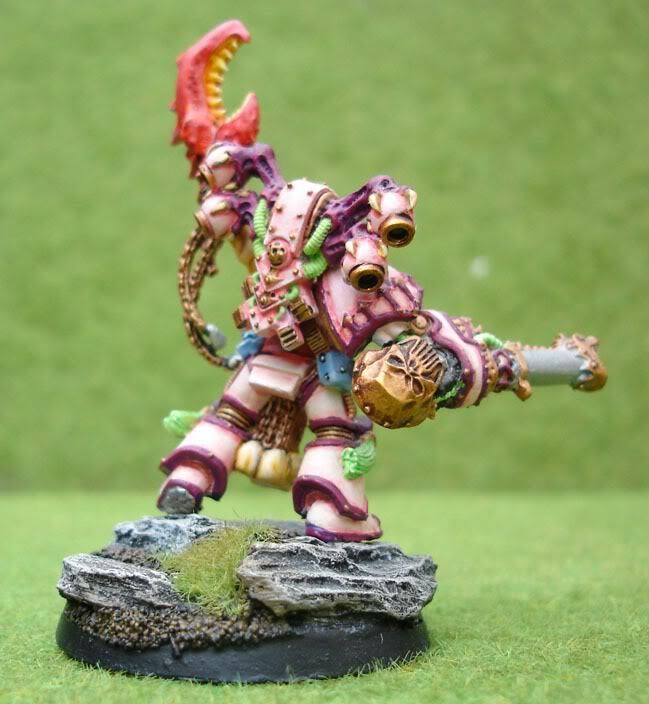 In current terms, he’d probably be a Chaos Lord, Mark of Slaanesh, Shriekwave or Bolts of Ecstatic Vexation to represent the Sonic Blaster, Power Fist or Lighting Claw for the crab claw… I imagine it’d probably be a terribly inefficient combination, but all I can say to that is Second Edition, Rule of Cool, and Who Cares? 8th Is Almost Upon Us Anyway. 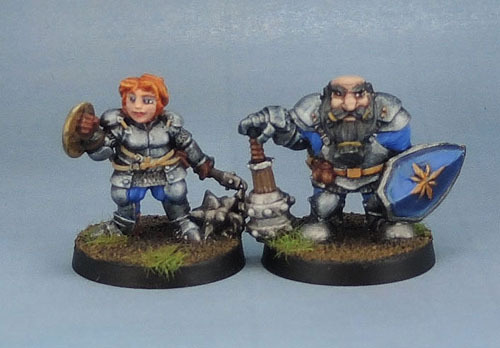 Painted in 2009, when I’d just gotten back into painting miniatures after a bit of a hiatus, these photographs were actually taken back in 2010. The only additon since then being a tuft of grass and a tuft of flowers – things not easily accessible back in the day. I certainly didn’t have any, anyway! Anyway – I hope you enjoyed this blast from my past! The much nicer model on the left is from 7th Edition. Apparently known as Khainite Assassin #2. I probably got him secondhand from eBay as well, and Stuff of Legends becomes useless the further into the 2000’s you head. 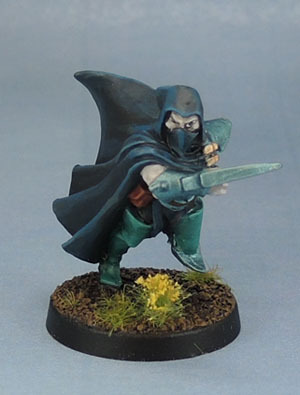 He’s pretty clearly the precursor to the current plastic kit of an Assassin (Shadowblade?) leaping off a spire-rock because dynamic posing. 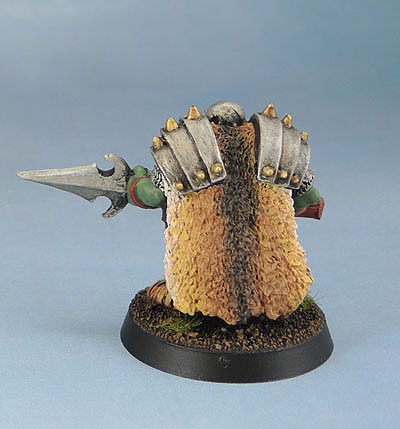 Despite being purchased for Blood Bowl, this guy had actually gotten to the point of being almost-painted. I’d painted him with D&D/Pathfinder in mind, and so he had been given dark blue (Drow) skin, and deep red-browns for his leather gloves and boots. 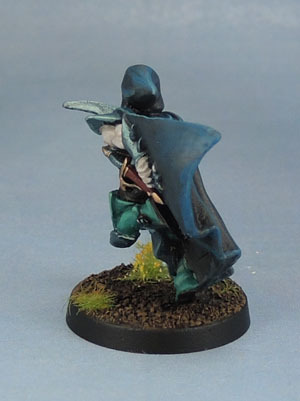 When he got reassigned to the Dark Elf army, I needed to redo the deep blue shading I’d started on his cloak with a more sea green, and change his leathergoods to Aqua/Turquoise shades – and obviously redo his face as well. Nothing fancy on his cloak. 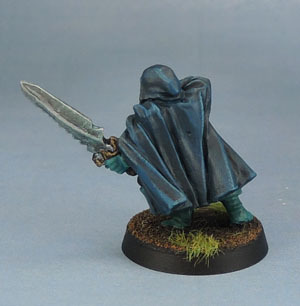 He’s an assassin, after all – and his cloak is there for practical purposes. I think the Turquoise shades have worked better than the dark blues that were there originally, and having come up this pleasingly, I know of some other purposes I’ll be using the same highlights in the near-ish future. 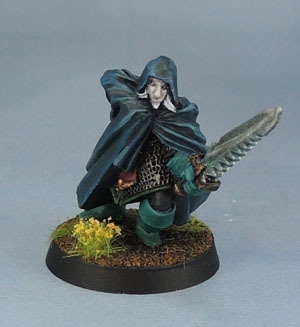 The flowers are a feature that I intend to use on figures from all of my Elven armies, which will be a small, unifying factor across the Dark, High and Wood brethren. 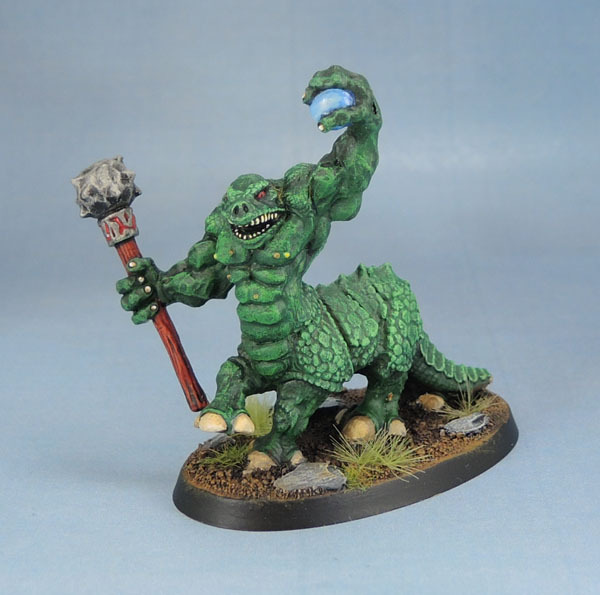 Despite my snide remarks about Gary Morley, this model is actually an Aly Morrison sculpt. The second model was started way back in 2013, shortly after we moved into this place and long before The War Room was converted into such, featuring a light box. A much more dynamic model, but without going to the point of ridiculousness, it was also a pleasure to paint – and the impetus for the repaint on the older model as well. I’m not 100% sure of the sculptor (Chris Fitzpatrick? ), since GW stopped crediting their artists by this point. If anyone knows for sure, please do LMK and I’ll edit it in! Since he’s a 7th Edition figure, and GW released most of the models for an army alongside the Warhammer Armies volume, I’d say he’s pretty safely a 2008 release. 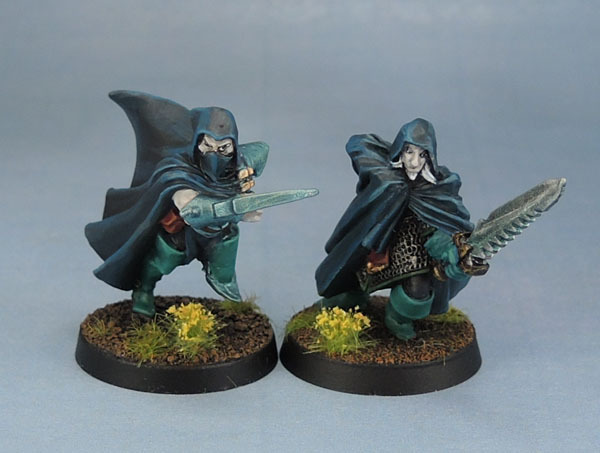 Having said that, the two of them sat on my painting desk for literally years until earlier this month, when I looked at the pair of them, each three-quarters-painted and made myself pull my finger out and get them both done. Which I managed to do in a very reasonable amount of time. That’s the trouble – I’m not playing Warhammer or KoW, etc very much at all these days, and so then my desk is covered in models – none of which have a particular pressing “need” to get finished and so I flit between a few minutes on this or that, and taking the 30 minutes or hour to finish a particular model or two becomes “too hard”, despite the pleasure that comes from completing a model. Most of my Fantasy work over 2016 was focused on the Undead and Gondor armies – both of which now have tons of painted models and units, yet have tons still unpainted and unassembled – and two units of cavalry each half-painted). 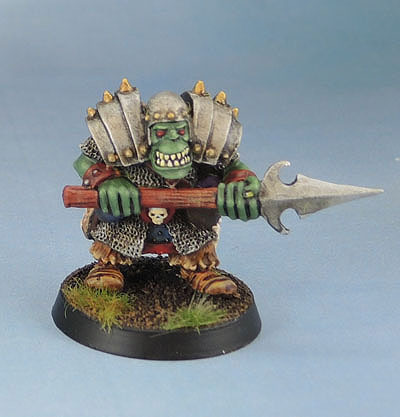 This year, I’ve made inroads on getting a Dwarf force to the point of functionality while mucking about with Orcs. I’ve got to get some lists written up again and focus on completing units to have more “finished” fantasy armies for Kings of War. Maybe then I can have the Elves up and running, even if only as a combined, pan-Elven force to start with. 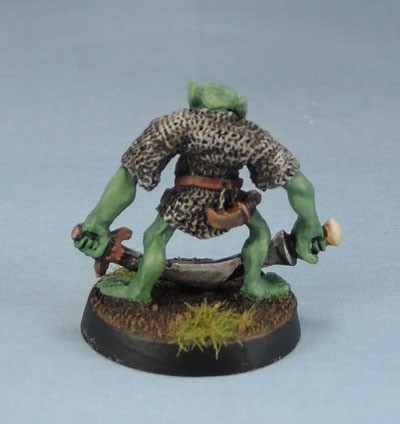 Another quite old model today – one of the 2-part Zoats for Warhammer Fantasy circa early 3rd Edition. There were at least three designs of the original Zoats – this one, the “Mage”. “The Warrior” with a mace-axe and also the original one-piece casting, which was a fair bit smaller. I’ve just read about the existence of a “Baby Zoat“, though I’m a little dubious, as the sculpt looks a little …modern? 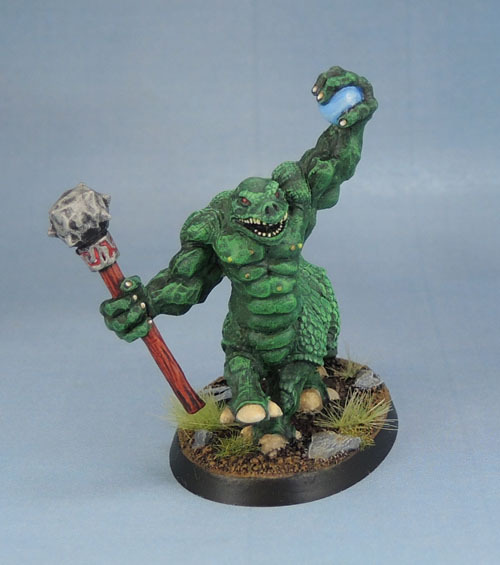 There are certainly more modern takes on the concept though, especially with the popularity of “Oldhammer”. 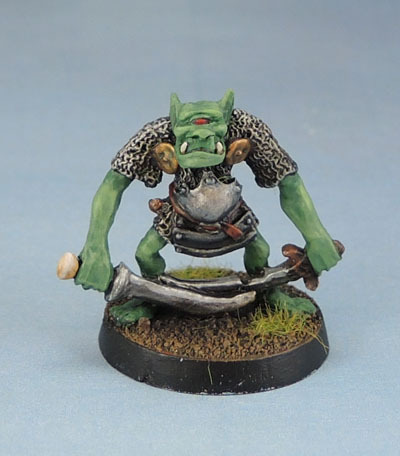 While the paint here is nothing special, this guy was actually painted back in the 1990’s, and I’ve learned enough by this time to know when to not strip down the models from my youth – especially when I’m sure I could find another on eBay if I want another go ’round. I don’t think it’s terrible – the drybrushing works on the rough, lizard-scaled skin, and I gave the more coarse scales on his back and flanks a slightly more pale/rough look. All I’ve done “today” was to tear him off the old green-flocked horse base and cut a slotta into a modern AoS-style cavalry base, and add some base clutter. I think it adds a huge amount to the presentation of this old model. I’d love to work out some stats to play AoS with it. That would be awesome! 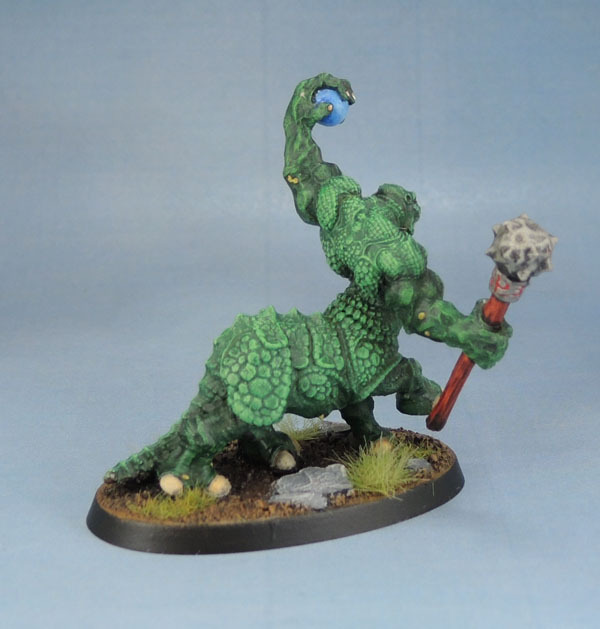 For anyone wondering “WTF is a Zoat?”, they were Bryan Ansell’s attempt to add some uniqueness to Warhammer, back in the early-ish days. Not a terrible motivation, especially given just how cribbed Warhammer is from everything else and how generic it was back in those days of 2nd and early 3rd edition. 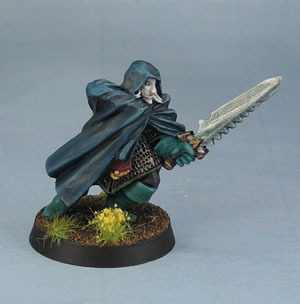 The story goes that the Design team of the day hated them and instead came up with the almost-as-ill-fated Fimir who were also lost and forgotten, but made a small, Forge World/Warhammer Forge comeback a few years ago. 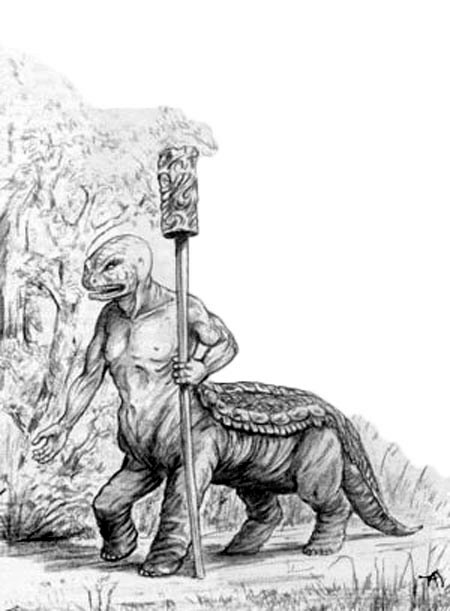 After all, what’s “Dark Fantasy” about a ripped, lizard-rhino-centaur sorcerer who looks he could tear the limbs off your torso without a second thought? Uh-huh. Sure, the concept art looks a little goofy and weaksauce, but the models certainly don’t! It appears that the design team won out, and quite quickly as I cannot find the Fantasy Zoats listed in the old Catalogues at all, even the ’88 and ’89 catalogues list the Fimir, but no sign of the poor old Zoats! (Aside from the 40k ones.) Their genesis and demise is discussed briefly here as a side note to a discussion on Fimir. Worth a read. 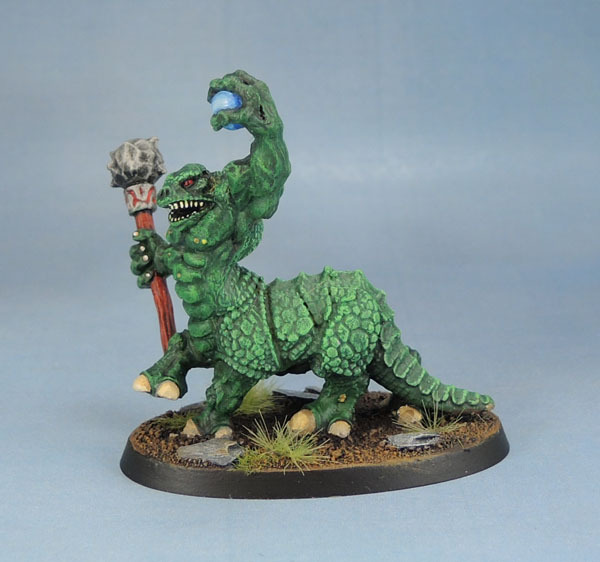 I did at one point have the 40k Zoat models, which were tied in as larger Tyranid creatures and which recycled the same body piece as the fantasy models, though I thought they were fairly poor executions of the superior-looking fantasy versions, I do at this stage wish I hadn’t traded them away back in the mid-90’s. In fact, after writing the previous sentence, I took a moment to have a quick look, and in a couple of weeks now, I should have two of the three 40k models arriving in my lap. So that’s going to be a thing, then. 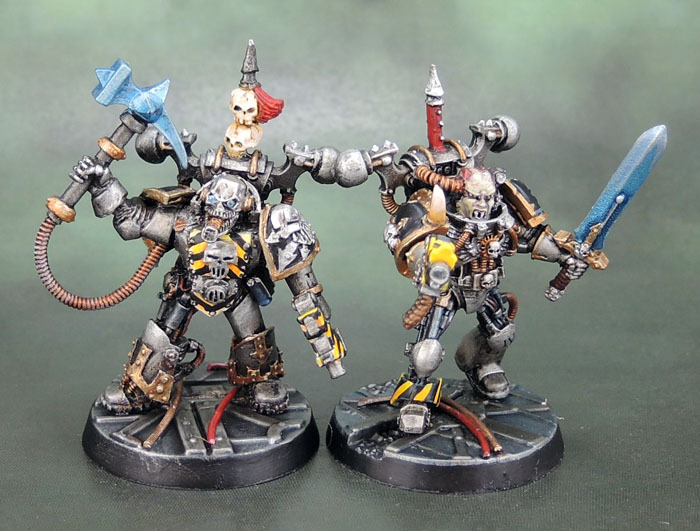 I’d planned to take new, better group photos of the Iron Warriors for today’s post, but unfortunately I was feeling under the weather yesterday, and am still that way now – so it didn’t happen. With a solid week of work ahead of me, it’ll hopefully happen next weekend! In the meantime, here’s a model where I already had the photographs ready. This guy is another of my renovated models. Having been painted back some number of years ago, the overall palette I’d used was more than a little too garish and had a few too many colours for my modern, more refined taste. The solution? Repaint parts of the model, tone some of it down, and give it a new base. Ergo! A new lease on life for this previously rather sad model. The slotta dates this model as sculpted back in 1995. It’s a hella-chunky model, and the huge shoulderpads really give him some heft. I think the rather plain helmet could have been a lot nicer, though. As with much of the old-school stuff in my collection, I purchased this model back in the 1990’s. Part of Kev Adams’ post-GW output, I find it odd that someone like RPE hasn’t re-released it alongside the other Heartbreaker stuff that they have. The cybernetic lens has now been filled in. oops! 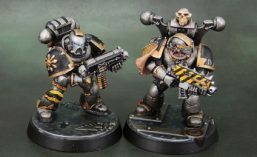 And now the final pair of my “Legacy” Iron Warriors. 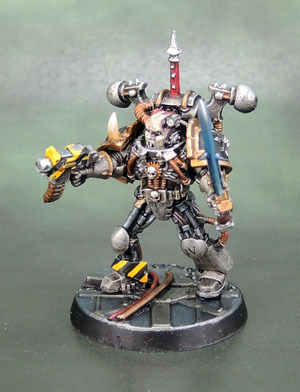 We have the original Aspiring Champion/unit leader, along with the Champion/Lord kitbashed from the original metal Iron Warriors Warsmith model, who is still actually available from GW. The leader (at present) of the entire motley crew is this guy. 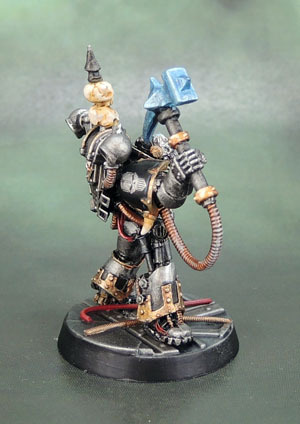 As mentioned, the base model is the Iron Warriors Warsmith. 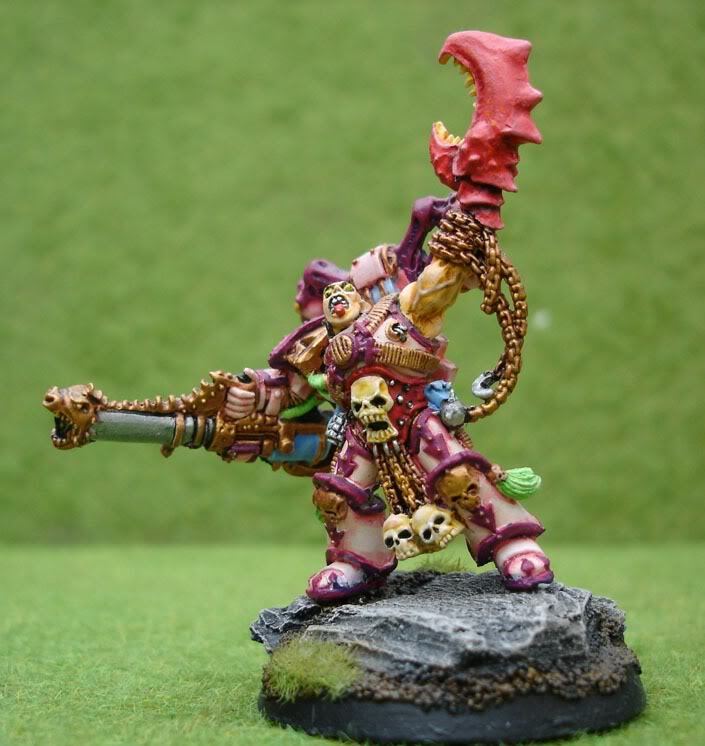 The head was removed and replaced with one from the 2nd edition noise marines. 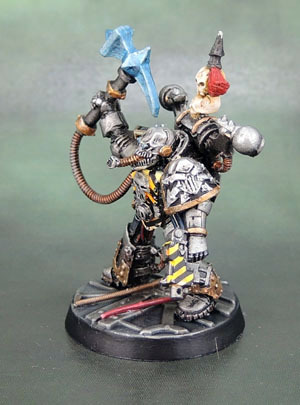 The marine’s entire head and visage has become an Iron Skull, reflecting the chapter icon, with the Xenomorph-esque tongue tying in with the copper cabling found across these models. 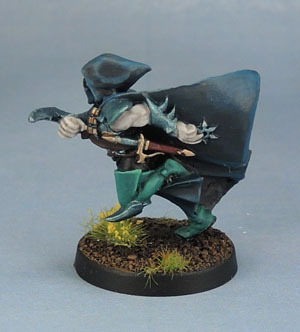 A Fleshmetal Exoskeleton under the current ruleset. 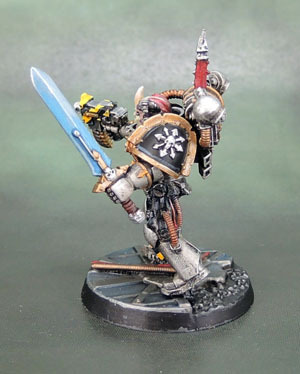 The left arm comes from an Assault Marine, capped with the metal 2e Iron Warriors Shoulder pad. 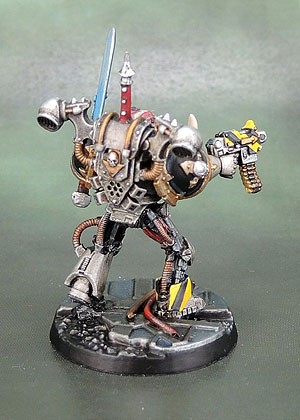 The backpack’s trophy spike comes from a 2e-era Chaos Terminator. The right arm of the Warsmith was completely removed. It was replaced with a slightly-dodgy-by-today’s-standards rebuild, made of a Berserker arm and a glove, hand and Hammer from a Chronopia model. The guitar wire cabling was added to help sell it as a powered weapon – a Thunder Hammer of unique fabrication with a rather wicked looking rear spike. In-hand, the hammer and hazard-striped chestplate draw the eye away from the dodgy join. Thankfully, it doesn’t stand out nearly as much in-hand as it does in these photographs. 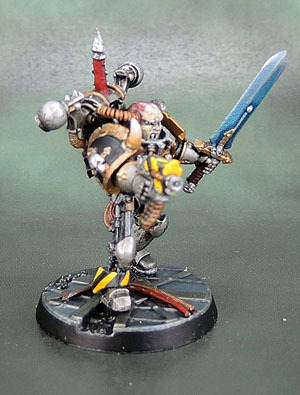 The breastplate and bionic legs on the original Aspiring Champion are from the Iron Hands upgrade pack, an excellent source of “official” bionics for any Astartes, and especially so for heavily-augmented Chapters and Legions such as the Iron Warriors. 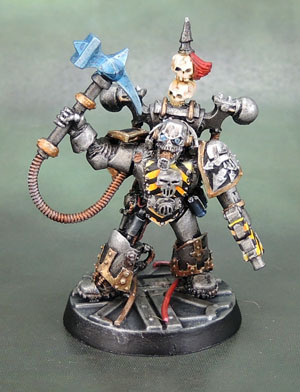 The rest of the model is pretty much stock, excepting the trophy spike that once again comes from a metal Chaos Terminator and the head, which is a Khorne Berserker head with some bionics cut from a SM helmet grafted onto the side. Damn, I missed that lens. I’ll have to paint that in now. Like I said, the rest of him is pretty much stock. Well, arms, shoulderpads and backpack, anyway. Since taking these photos, I’ve cleaned up the base edging and fixed the odd lens I’ve missed on these and the others in this series. Along with their “red dot” targeters on their weapons. Not that this helps you. I took some group shots the other day alongside these. I might hold off posting them and take some new ones today to post tomorrow, now that I’ve touched these guys up. 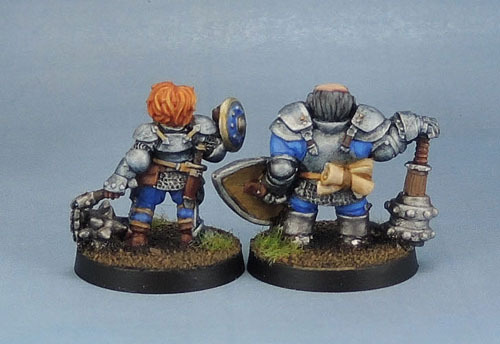 I also re-black-rimmed their bases and darkened the metallics on the bases slightly to help distinguish the metallic models from their metallic flooring, which was another thing I’d missed in my haste to complete them and excitement to photograph them.